Today there were two options.. a shorter 16km day (which had my name written all over it) or a 32km day.. I decided not to commit to the sensible choice and see how things went. I set off before dawn and wandered alone through country lanes as the sun slowly began to climb over the hills behind me . (Cue obligatory sunrise photo).. The path left road and continued along dusty trails toward some suspiciously large hills.. I assumed the path would veer sharply thus avoiding said hills.. I held that belief as the hills got closer.. Any minute now, sharp left… But no, apparently I was climbing.. as soon as I realised I was in for a steep climb my athlete instinct kicked in.. I rolled 3 cigarettes and smoked them one after the other.. who knew when I would have the breath once the climbing began?.. (I’m truly proud of how I’ve learned to adapt since I started walking.. before now I would have stumbled blindly onto the hill completely unprepared in the nicotine department). I wheezed my way up and over several hills.. most were ok but an occasional steep section did sneak in now and then..
Before long I was up along side the wind turbines.. the rythmic ‘Whoomp Whoomp Whoomp’ is quite a pleasing sound as they spin only metres above your head. I made it to the 16km point and it was tone to make the decision.. call it a day (in true Andy style).. or carry on..
Maybe it was the heat.. or a trick of the light.. but it was as though I could see the original members of team tortoise stood smiling and pointing into the distance.. (I say team tortoise.. it could quite easily have been the original cast of Dallas… They look quite similar).. I decided to go for it.. I tightened my laces, hoiked my backpack into the optimal position and headed straight into a cafe for as much sugar and caffeine as I could safely consume. The second half of the day wasn’t too bad to be fair.. I’d done most of the climbing and so it was mostly level or just gentle slopes for the most part. Roughly 3 or 4 km from my destination, I rounded a corner and all of a sudden I could see the ocean sparkling in the distance.. it was actually strangely emotional… I’m not sure if it was 300km of asphalt and dusty trails or just the sugar rush wearing off but I was honestly moved by the sight below me. The last 2km into Cee is a toecrushing steep decent to sea level… I limped my way down with feet on fire from the long day. Bravo chico! 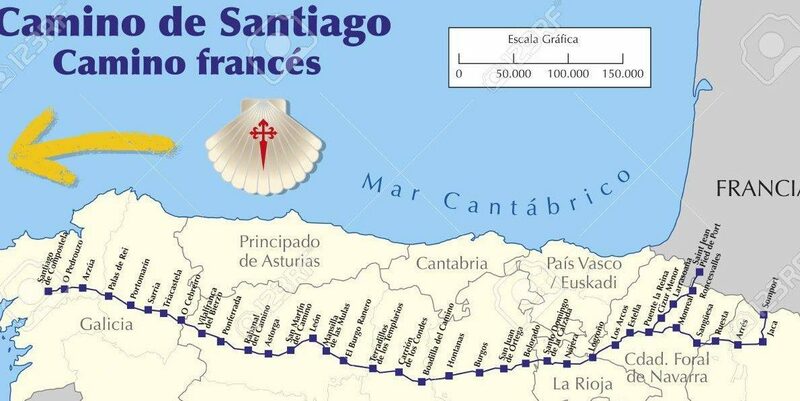 From Santiago to Finisterre was my favourite part of the Camino in some ways. The time pressure was off, seeing the ocean for the first time was glorious and the trail was less populated. 32K in one day, impressive! Buen Camino! I womdered if you would tackle the 32 km to cee! Congrats. I kept thnking why are there still ao many climbs when we are so close to the ocean!.. and yes seeing that sparkiling ocean at first sight, its ok to get emotional. Hope you found a great cheese sandwhich! Tantalisingly close to the end. Watching the sun set over the ocean was a relatively unique experience for an Aussie from the eastern seaboard. Only once before had I seen the sun set into the ocean and that was in San Francisco in 2006. Enjoy and well done.